Pear-flavored sugar and rosemary spice join sparkling wine for this festive gluten free holiday cocktail sipper. 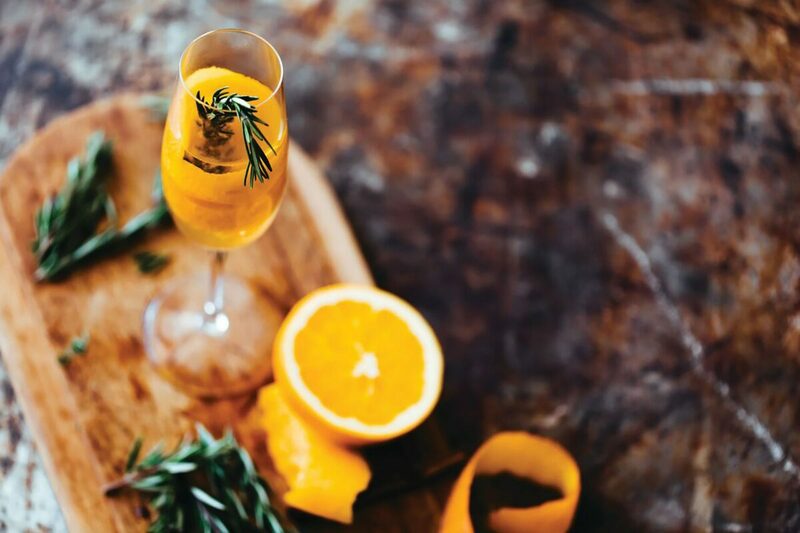 In a champagne flute, combine the brandy and the Cinnamon Anise Pear Syrup. Using a paring knife or vegetable peeler, start at the top of the orange and carefully cut diagonally in a long, continuous strip of orange peel without the white pith. Roll the peel onto itself into a spiral, then drop it into the flute and let it unravel. Add the sparkling wine, then smack the rosemary sprig between your hands to release its oil and drop it in the flute. Sprinkle the pinch of cinnamon on top, gently stir, and serve. MAKES ABOUT 1-1/2 CUPS Use this seasonal syrup to add flavor to tea or your favorite fall drinks or to dress up ice cream (especially if you include the strained, cooked pears). Store airtight in the fridge for up to 1 week. In a saucepan over medium-high heat, add the pears, sugar, 1 cup water, cinnamon, and star anise. Bring to a boil, reduce the heat, and simmer until the pears are soft, about 15 minutes. Let the pears and syrup cool in the pan. Once cool, strain through a fine-mesh sieve, then discard or reserve the solids for another use. Stir in the lemon juice and let cool completely.